Situated in the Nizamuddin area of Delhi is the tomb of Hazrat Nizamuddin Auliya, which is one amongst the popular Sufi mausoleums in the country. The Dargah in addition houses the tombs of poet Amir Khusro and Shah Jahan's eldest daughter and consort Jahanara Begum. Hazrat Nizamuddin was a well-known saint who belonged to the Sufi Chishti order, who had a large number of followers in the country. He was the spiritual successor of Khwaja Moinuddin Chishti of Ajmer. The tomb of the revered Sufi saint is visited by a large number of devotees - who not only belong to the Islam faith but are followers of other faiths as well. Many sultans of the Delhi Sultanate, like Muhammad Tughlaq and Alauddin Khilji were staunch devotees of the Sufi saint. 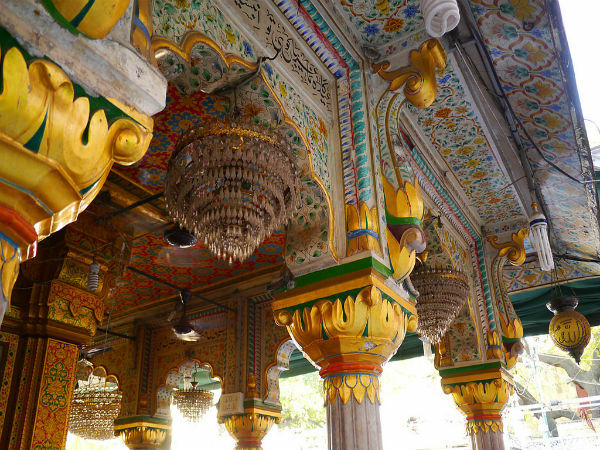 The structure of the Dargah consists of a square chamber, which is surrounded by halls that are decorated with arched openings. One can find a dome atop the tomb, which is decorated with vertical stripes of black marble and a lotus cresting that forms a crown to the entire structure. The marble-domed tomb of Amir Khusro was constructed in the year 1605. The intricate filigreed screens which surround the small room have a tall tombstone that was constructed in the year 1496 by Mehdi Khwaja, who was a courtier in the kingdom of Emperor Babur. The structure was originally constructed in red sandstone; but at present, it has been covered with years and years of paintings. It is believed that in the early 20th century, Hasan Nizami who was the keeper of the Dargah accidentally scratched the paint at one part of the structure and he discovered versified dates in Persian, which were engraved on the sandstone. Across the entrance which takes you to the tomb of Amir Khusro is a heavy wooden door that leads to an ancient room, which is believed to be constructed in the 14th century. The room is generally kept locked and is opened only for exclusive special gatherings of the Sufis. Close to the tomb of Amir Khusro are two other tombs: one of Jahanara, who was Shahjahan's daughter and his consort and the other is of the Mughal emperor, Muhammad Shah Rangila. The grave of Jahanara is covered in grass in accordance with the inscription written on it which says, "Let nothing cover my grave, save the green grass: for grass well suffices as a covering for the grave of the lowly". Outside the Dargah complex is Ataga Khan's tomb, which is an impressive structure built in red sandstone and is thickly laid with marble and coloured tiles. A nobleman named Faridun Khan built this structure in the year 1562 during the rule of Akbar. The area around the tomb of the saint has many more large and small tombs, which have been built over the passage of time and have been considered auspicious to be buried near the saint's grave. At the West of Nizamuddin's tomb is Jamaat Khana Masjid, which is built in red sandstone. The mosque has three bays, which are topped by a low dome. The arches are decorated with lotus bud carvings on the lines of the Alai Darwaza at the Qutab complex. The mosque was constructed by one of the sons of Alauddin Khilji and is believed to be the oldest structure in the complex.